A DUP councillor has lodged a complaint with Queen's University after a professor tweeted "hell is too good" for no deal Brexiteers. Professor John Brewer caused a "social media storm", the News Letter reports. He tweeted: "Special place in hell for no deal Brexiteers? Hell is too good for them." It follows European Council president Donald Tusk's comment of a "special place in hell" for those who promoted Brexit without a plan. 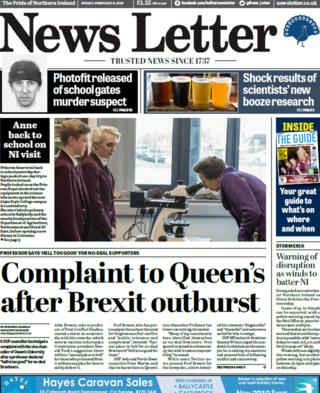 The paper leads with the reaction to the tweet by the professor of post conflict studies and says DUP Ards and North Down councillor Peter Martin has lodged a complaint with the university's vice chancellor. Mr Martin said many of his constituents "have identified themselves as no deal Brexiteers" and added that while free speech is valued in a democracy it "comes with responsibility". DUP MP and Brexiteer Sammy Wilson urged the academic to think about the example he was setting his students and accused him of inflaming conflict and controversy. Brexit tensions are also the front page focus for the Belfast Telegraph in which a business leader accuses MPs of abandoning the people of Northern Ireland by their failure to reach a Brexit deal. Institute of Directors chairman Gordon Milligan said it would be "unforgivable if the politicians in Westminster unleash the havoc that results in us sleepwalking into a no-deal Brexit by playing down the clock like a game of countdown." Mr Milligan made the comment in an address to about 400 business leaders at the Institute of Directors's annual dinner at the Crowne Plaza Hotel in Belfast on Thursday. 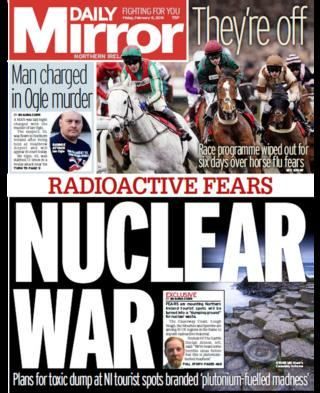 Moving away from Brexit, The Daily Mirror says fears are mounting across Northern Ireland that tourist hotspots may be turned into a "dumping ground" for nuclear waste. It says spots across Northern Ireland, including the Mourne Mountains, the Causeway Glens, the Sperrins and Lough Neagh are being examined by a government firm hoping to find a permanent place for the UK's radioactive material. Shauna Corr reports that thousands have signed a petition against a Geological Disposal Facility in the Mournes, while Newry Mourne and Down Council has voted to write to Westminster saying it will never consent to a site in the area. Friends of the Earth's Declan Allison tells the paper: "We've heard some terrible ideas before but this is plutonium-fuelled madness. "Shipping radioactive waste across the Irish Sea, then driving it along country roads, to store underground for hundreds of thousands of years sounds like a plan conceived in a radiation-addled brain." The front page of The Irish News declares there is "No Stakeknife Link" to Notarantonio murder. It says the police officer leading an investigation into the Army's highest-ranking IRA agent has told the family of a west Belfast pensioner murdered in 1987 that he can find no link to Freddie Scappaticci. Francisco Notarantonio, 66, a former republican internee, was shot dead by the UDA in his west Belfast home. The report says it had previously been believed that Mr Notarantonio was killed to protect Mr Scappaticci, has been named as the agent codenamed Stakeknife.